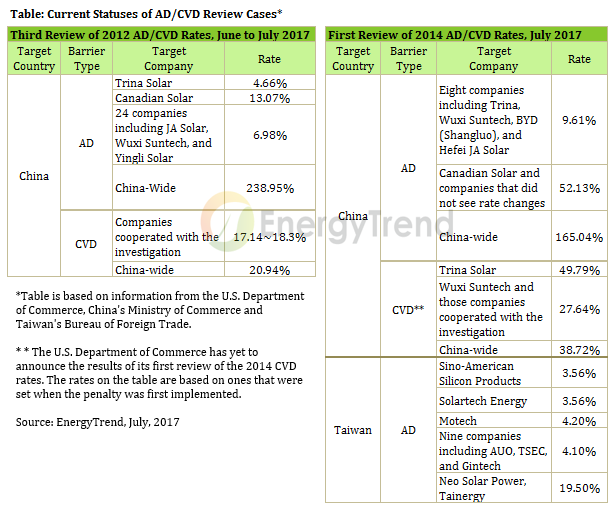 The U.S. has further lowered the antidumping and countervailing (AD/CVD) rates imposed on Chinese and Taiwanese solar imports in 2012 and 2014, according official statements on the recent AD/CVD reviews conducted by the U.S. Department of Commerce. Many PV cells and module manufacturers have managed to evade U.S. trade barriers by setting up factories in third-party countries, majority of them in Southeast Asia. 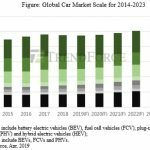 However, TrendForce’s green energy division EnergyTrend believes that the reduction of AD/CVD rates will have an impact on the global market this third quarter. Module orders from the U.S. have grown significantly since the second quarter of 2017, as Suniva’s petition to the U.S. International Trade Commission for relief against solar imports (under Section 201 of the 1974 Trade Act) has increased uncertainties and risks in the market. Although the overall production capacity in third-party countries has expanded, it is still insufficient to meet the surging demand. With prices of non-Chinese cells and modules rising, U.S. and European buyers in the downstream of the supply chain are considering different sources and options. The U.S. government has treated the 2012 and 2014 AD/CVD review as five separate cases. The table below shows their current statuses. Note that information and rate calculations are based on various official announcements from government agencies in the U.S., China and Taiwan. EnergyTrend analyst Jason Tsai pointed out that PV product manufacturers have evaded or minimized the costs resulted from the U.S. trade barriers by first utilizing their production capacities in third-party countries, where the AD/CVD rates are zero. If they assemble modules in these countries but use Taiwanese cells, their modules are going to be hit with rates ranging from 3.56% to 4.2%. If they resort to using facilities in China or Taiwan for both cell and module production, then AC/CVD rates for these products will be the range of 21.8% to 31.37%. Before the results of the latest AD/CVD reviews were announced, Taiwanese cell suppliers had been hit with AD rates ranging from 11.45% to 27.55%. The barrier to the U.S. market was extremely high for Taiwanese products compared with products made in countries such as Vietnam, Thailand and Malaysia. The U.S. investigation of Suniva’s petition, on the other hand, has created a demand surge that cannot be met by just relying on factories in the third-party countries. The deployment of Taiwanese cells in non-Chinese modules has kept prices from rising sharply. The amount of orders from the U.S. and Europe will determine whether this practice will continue to keep module prices stable. However, some module orders have even gone to India and Turkey, which are not traditional sources for non-Chinese module imports. With the outcome of Suniva’s petition unresolved, Taiwanese cell suppliers can expect an increase in sales volumes and prices this third quarter. 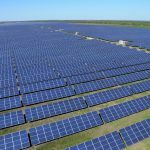 Despite the additional cost resulted from AD/CVD, China-based solar companies have been able to maintain sufficient profit margins in the U.S., where the average prices of multi-Si and mono-Si PERC modules have now reached US$0.38 and US$0.46 per watt respectively. Prices could still go up in the U.S. sometime near the end of September. Therefore, Chinese manufacturers may consider expanding their U.S.-bound exports during the off season of August. By doing this, they could capture more market share, raise utilization of their domestic production capacities and ease the price decline for modules in their home market. If there is an influx Chinese products in the U.S. market, the price upswing related to the risks of Suniva’s petition could moderate, with the average price of multi-Si modules estimated to reach the upper limit of US$0.41 per watt.